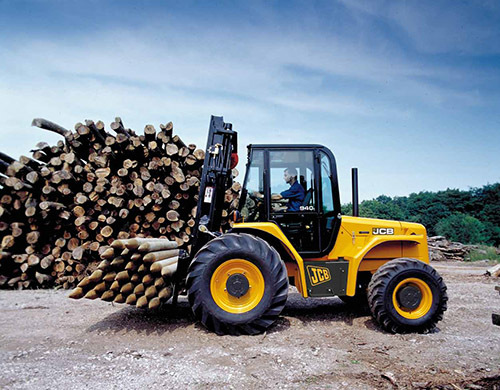 Docks, yards, special events, timber forestry, construction sites, builders’ merchants... JCB rough terrain fork lifts (RTFL) are the reliable, versatile and easy-to-use solution for virtually any rehandling environment you can think of. Designed for high mobility and superb productivity in rough terrain areas, there are three RTFLs in the JCB range with lift capacities of 2.6 to 4 tonnes and lift heights from 3.6 to 6.7 m. At the heart of each machine, all of which come as two or four-wheel drive, is a 63kW (84hp) JCB Dieselmax engine delivering powerful performance. The JCB Synchro Shuttle transmission with integral torque converter gives fast, smooth directional change, while the four-speed synchromesh gearbox and Max-Trac axles give top performance and drive over the roughest ground. JCB RTFLs allow you to choose between four different mast heights, each one designed for excellent forward visibility and offering up to 18° of forward tilt to assist load handling and placement. In addition, the sideshift function makes placing materials on scaffolding much easier. To cover all applications and optimise versatility, there is also a selection of attachments, three carriage types and a range of tyres to suit various applications and environments. Add all of this to an operator environment that is designed for comfort and all- round visibility, along with proven, reliable technology and superb serviceability, and you have a rehandling solution with a huge amount of potential.